In this process, metals and alloys are plastically deformed into semi finished or finished products by being pressed between two rolls which are rotating. The metal is initially pushed into the space between two rolls, thereafter once the roll takes a ‘‘bite’’ into the edge of the material, the material gets pulled in by the friction between the surfaces of the rolls and the material. The material is subjected to high compressive force as it is squeezed (and pulled along) by the rolls. This is a process to deal with material in bulk in which the cross-section of material is reduced and its length increased. The final cross-section is determined by the impression cut in the roll surface through which the material passes and into which it is compressed. The two-high rolling mill consists of a two-high stand with two horizontal rolls, placed exactly one over the other. In this type of mill, one or both the rollers are adjustable. In its operation, the metal is passed between the two rollers rotating at the same speed but in opposite direction. After each pass, the direction is reversed. The metal piece is turned through 90°, which keeps the section uniform and with fine grains. Nearly 25-30 passes are required to convert an ingot into a bloom. The arrangement of two-high rolling mill is shown in Fig.(a). The three-high rolling mill consists of a three-high stand with three rollers, placed in a single vertical plane. The upper and bottom roller rotate in the same direction whereas the middle roller rotates in the opposite direction. It is used for rolling of two continuous passes in a rolling sequence without reversing the drive. It has higher output rate than two-high mill. It is less expensive to manufacture. The arrangement of three-high rolling mill is shown in Fig.(b). The four-high rolling mill consists of four rollers, two of which are working rollers (small diameter) and the other two are backing up rollers (larger diameter). The all four rollers are arranged above one another in a vertical plane. Also, the backup rollers always have larger diameters than those of the working rollers. This type of rolling mill is used in sheet rolling. To reduce the rolling force (F) of the metal on the rolls and the power requirement, it is suggested to design rolls as small as possible. If such small diameter rolls are used alone, they will bend and result in non-uniform thickness distribution along the width of the sheet. For this reason, another pair of two backup rolls are used to minimize bending and deflection of small working rolls. The arrangement of four-high rolling mill is shown in Fig. (c). The multi-high rolling mill consists of two small diameter working rolls, a row of intermediate driving rolls, and a raw of backup rolls. This arrangement involves a cluster of either 12 or 20 rolls, resulting in exceptional rigidity of the whole roll system. Multi-high rolling mills are used particularly in the manufacturing of very thin sheets of thickness about 0.01 mm and width up to 2000 mm. In this case, the working rolls must have very small diameter, usually 10 mm to 30 mm. Such small diameter working rolls make a drive practically impossible. Therefore, they are driven by friction through an intermediate row of driving rolls that are, in-turn, supported by a raw of backup rolls. The arrangement of multi-high rolling mill is shown in Fig. (e). The universal rolling mill consists of two vertical rolls and two horizontal rolls. The vertical rolls are idle and are arranged between the bearing chocks of the horizontal rolls in the vertical plane. Universal rolling mills are used for producing blooms from ingots and for rolling wide-flange H-section beams. 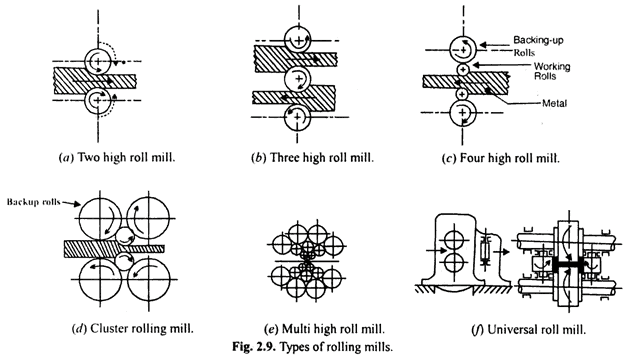 The arrangement of universal rolling mill is shown in Fig. (f).